10% OFF glass, vape or juice purchase! Show this. Rate and review Area 51 Tobacco and Novelties (Princess Anne) in Virginia Beach, VA, United States! 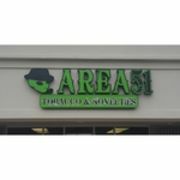 Share your experiences at Area 51 Tobacco and Novelties (Princess Anne) with your friends or discover more Tobacco Shops in Virginia Beach, VA, United States.